Community Transport Waltham Forest (CTWF) is a registered Charity with a dual purpose of providing sustainable group transport facility for local voluntary and community organisations and developing services which address the impact of social exclusion experienced by the elderly and disabled individuals in our community. 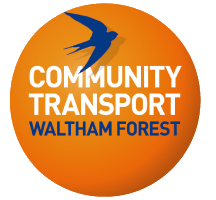 We are embedded into the voluntary & third sector community of Waltham Forest and Newham and work strategically with our fellow community transport organisations in neighbouring boroughs. Encourage and support independent living thereby decreasing demand on public services and support. We maintain our strong ethos that ‘community matters’ recognising the value of our staff by proudly paying the Living Wage. Our main purpose is to provide assisted transport to organisations and individuals in need. This is made possible through the provision of 22 minibuses on a self-drive or driver provided basis. Door to Store Shopping Service is aimed at fostering and enabling elderly individuals to continue to retain their independence, make new social connections, and improve their health and wellbeing through being able to undertake their everyday essentials. The primary aim of our excursions club, which is our fastest growing service is to provide viable alternatives to the crippling effects of social isolation and loneliness experienced by the elderly and disabled by offering a programme of outings to places on interest during the summer and winter in a group setting which has forged friendships, and support with many individuals now communicating and planning their days out. We continue to identify new areas of intervention and this year undertook a partnership with the Dementia Alliance to transport dementia sufferers to do a weekly session of Tai Chi, which enabled individuals to participate in a regular exercise class, we also worked with the Lloyds Park Bowls Club to transport visually impaired people to play bowls over a 8 week period which enabled individuals who would otherwise be isolated participate alongside able bodied individuals in a sports activity. We were able to secure funds from Morrisons trust to develop our Excursions programme for elderly in Waltham Forest and Newham. A key new service we developed was a youth orientated Big Day Out for looked after young people and young carers in Newham and Waltham Forest using self-generated funding via sponsorship and two small grants. Through our fleet replacement programme we have been able to demonstrate an 8% increase in our fuel efficiency. In addition to demand responsive services we provide our own services to meet the needs of individuals with mobility problems. These include the Door to Store Shopping Service and Excursions Club Programme, as well as training through our Community Driving School. Our statistics indicate that for the period 2015/16 we delivered a total of 11,910 trips and carried 126,781 passengers. We currently have 188 individual members on our Door to Store Service; we delivered a total of 2,579 trips and carried a total of 2,822 passengers. We currently have 188 Excursions Club members (a 23% increase on last year) and undertook 12 scheduled outings. We trained 197 individuals via our Community Driving School programme. We undertook a FORS accreditation (Fleet Operators Recognition scheme) to seek external evaluation of our services in line with passenger fleet services and achieved Bronze accreditation; the value of exercise provides us with support and ongoing improvement of our management of the service. Group Hire allows members to access affordable service as and when required, enabling their members to actively participate in their programmes and activities and who would otherwise have been excluded through lack of access to transport services. Door to Store Service enabled members to continue to live independently and undertake their everyday essentials at a time of their choosing regardless of the weather with a guaranteed time for return to their homes. Feedback from users indicated that this was the most important factor for them, as using other services with no defined return made them nervous and unable to make arrangements for the day. Excursion Club is a key service to tackle loneliness and isolation amongst older people, which was supported by the Morrisons foundation In addition to attracting members from our local catchment area, we trialled the use of our service with a disabled elderly resident in Loughton who was unable to find any suitable activities within her community and the feedback was ecstatic! This client was able to interact with new people and enjoy views of the South-East she had not seen in decades. With over 350 passenger journeys taken and positive feedback received, 2015/16 has been a successful year in our efforts to combat social isolation and improve the quality of life for the elderly and disabled in Waltham Forest; over 40% of our service users strongly agreed that the service helps them feel less lonely and more than 80% stated that they eagerly look forward to the events. Our work with Dementia Alliance, Bowls Club enables us to reach new individuals and enable these individuals regardless of their disabilities to actively participate in community life. Our biggest impact was our BIG Day for young people as it was a first for CTWf, built new relationships and deliver a service to individuals who had rarely experienced a day out. Feedback from this can be seen in the below link.